In recent years, Russia has been hard at work shaking off the gray vestiges of communism. After a 6-year, multi-million dollar renovation, Moscow’s world renowned Bolshoi theatre reopened. St. Petersburg now sparkles as in the days of the czars, duly deserving its status as a UNESCO World Heritage site. Traveling independently offers the flexibility to experience these wonders far from the madding crowd. 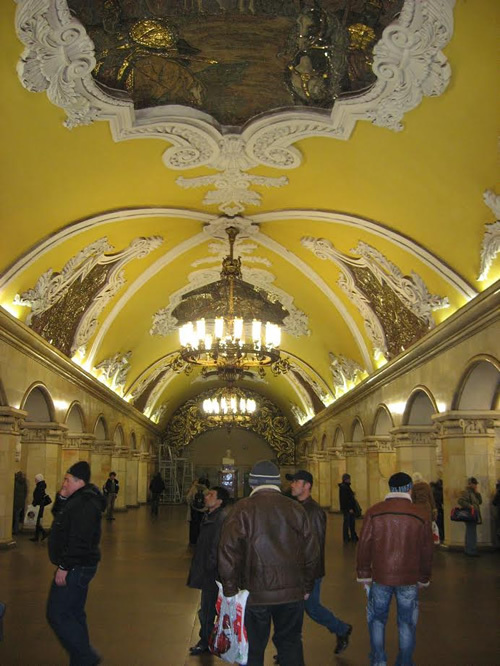 But Russian rules can become Kafkaesque nightmares for unwary travelers. Arriving in Russia without a visa is grounds for denial of entry and return home at your own expense. Check with your local Russian consulate about what kind you need. A Russian tourist visa lasts up to 30 days. Other types last longer. Russian rules do not make personal exceptions, even if your plane is about to leave. I learned this the hard way, when I snapped up a discount ticket to Moscow two weeks before departure. Then I realized I had only one blank passport page—the last one—which cannot be used for Russian visas. So I had to apply for a new passport, as well as a rush visa. Several sleepless nights later, I received my visa one day before departure. Spare the headache, and allow at least one month to process a Russian tourist visa. If you travel frequently, check that you have enough pages in your passport. Expedited processing takes three business days. Regular processing takes 10-20 business days. Processing for homestays takes twenty business days minimum. The day you drop off your application does not count towards processing time. For a steep fee some travel agencies do the paperwork for you, which eliminates confusion but does not decrease processing time. If you live far from a Russian consulate, check with the nearest one about obtaining a visa by mail. Some will do this. Others have stopped processing visas by mail and you will need to enlist the aid of a travel agency. Obtain a Russian-based sponsor (hotel, hostel, tour agency, relative or friend). For homestays, the sponsor obtains an invitation from the local office in Russia and sends it to you. If your sponsor is a hotel or hostel, contact them. They will send you an invite and voucher (proof of pre-payment for lodging). If you are visiting more than one city, going through a travel agency may be easier. You will need to write the dates and name of each lodging on your application, with a maximum of six. As invitations and vouchers from each lodging may be necessary, the paperwork can become complicated. You may also have problems proving proper sponsorship to customs officials on arrival. Submit and print an official visa application form via the consulate or one of several intermediary websites. Your signature on the application must match the one in your passport. Original passport valid for six months after your departure from Russia. Two passport-sized photos matching the photo in your passport. Do not wear glasses if you are not wearing them in your passport photo. This is Russia— no smiling. Acceptable form of payment. Some Russian consulates do not accept personal checks, ATM, or credit cards. If so, you will need a certified bank check or money order. After receiving your visa, check that your name and dates are correct. Russian visas are granted only for the dates listed in the sponsor letter. The first date is the earliest you may enter Russia. The second is the date by which you must leave. Overstaying invalidates your visa, which bars you from leaving Russia. Overstaying by three days or less may not be a problem, subject to the whim of Russian immigration officials. If you get stuck in Russia, your sponsor will need to request a visa extension, which can take up to twenty days. The Catch 22: lodgings may refuse to accept you with an expired visa. If you are staying more than three days in Russia, you will need to register your visa and migration card with your sponsor. Most hotels do this for you upon check in. If you are spending less than three days in a hotel, registration may not be necessary, but is a good idea. Russian police are authorized to stop you for random document checks, so carry your travel documents with you. Watch your kopecks. Bloomberg Businessweek ranks Moscow as among the world’s most expensive cities. The ruble is the only accepted currency. ATMS are plentiful in most major cities, but may not always be stocked with cash. Credit cards are not universally accepted, and most places do not take travelers checks. Most sightseeing locales, including The Hermitage, accept cash only. The Kremlin accepts credit cards. Cash may be the only acceptable form of payment for train and airplane tickets. If you are staying in a hotel, ask the concierge to buy tickets for you, which may allow you to pay by credit card. Bottom line: bring enough cash to cover a few days of empty ATMs and turned down credit cards. In Russia, foreigners pay twice the entrance fee as Russian citizens at museums and cultural sites. Tickets to the opera and ballet are also priced higher for foreigners, so budget accordingly. Travelling in Russia can be challenging for non-Russian speakers. Migration cards may be in Cyrillic only, and immigration officials may only speak Russian. At train stations, most signs are in Cyrillic and ticket sellers usually do not speak English. Moscow metro signs use an inconsistent alphabet. Some signs are in Cyrillic, others are in the Latin alphabet. It is a good idea to obtain a Cyrillic subway map, which is available at airport information desks. I successfully navigated the mammoth Moscow metro by matching backwards “R’s” on my map with backwards “R’s” on subway signs. It was worth the effort to wander through these stunning and historic stations. St. Petersburg is more tourist friendly. Subway signs are generally in the Latin alphabet. Some are even in English. Be prepared for steep cab prices. In St. Petersburg, the minimum charge is $20, which does not mean that cabs are quicker. During the St. Petersburg rush hour it took over an hour to drive four blocks, a distance that I could have walked in ten minutes. In Russia there are few registered cab services, so rely on good judgment when using unmarked cabs. They have been associated with foul play. Dreaming of high adventure on the trans-Siberian rail road? Before jumping on a train, think about it: Russia is vast. If spending your vacation in a cramped compartment, staring at unending countryside sounds less appealing, consider domestic flights. In major cities you can book flights in advance. In other areas, tickets can be bought for cash at the airport. Departure gates are subject to change, and signs are usually in Cyrillic only. Many domestic airports are still Soviet-style. During December in the St. Petersburg domestic airport, I shivered in an unheated departure lounge for 40 minutes before boarding. Renting a car in Russia is not advisable unless you speak good Russian and have strong nerves. Road conditions can be poor to nonexistent in some areas, and roadside checkpoints are common. Newer roads may have few gas stations or restaurants. Tourists can drive in Russia for up to 60 days with a valid US driver’s license and a notarized Russian translation. An International Driving Permit from the American Automobile Association or the American Automobile Touring Alliance is also acceptable. Insurance valid in Russia is required. 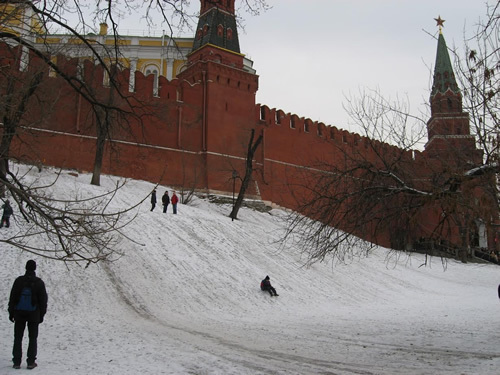 Sledding near the Kremlin walls in Moscow. Mafia thugs? Vodka soaked brawls? Terrorism? Russia is still the bad guy in movies. Melodramas aside, being blasé about safety is unwise. The US State department warns against travel to Chechnya and the North Caucasus, where terrorism, bombings, and kidnappings have occurred. Since Mount Elbrus, the highest peak in Europe, lies in the Northern Caucasus, scaling this peak—even if you are in stellar shape—is not advised. In cities, crowds and public gatherings can lack proper security. The threat is sometimes real: there have been bombings on subways, buses, trains, and flights. The evening I arrived in Moscow there was a demonstration in Red Square and travel to this area was restricted. I remained in my hotel and slept off my jet lag that evening. Unfortunately, Russia is not immune to racist sentiment. Those of African, South Asian, or East Asian descent, or who appear to be from the Caucasus or Middle East, have been targeted. There have been reports of violent attacks against US citizens who are members of minority groups. That samovar to die for in the Moscow flea market? The beluga caviar you cannot buy back home? Think twice. Russia has strict rules against exporting items of “cultural value.” Even Russian-made ballet slippers are stamped “Not for Export from Russia”. Trying to take such items out of Russia can put you at risk for arrest, even if you think you have bought them legally from a reputable source. To be safe, keep your receipts. Anything that looks old and expensive needs a certificate confirming its worthlessness. Certificates are available from the Russian Ministry of Culture. 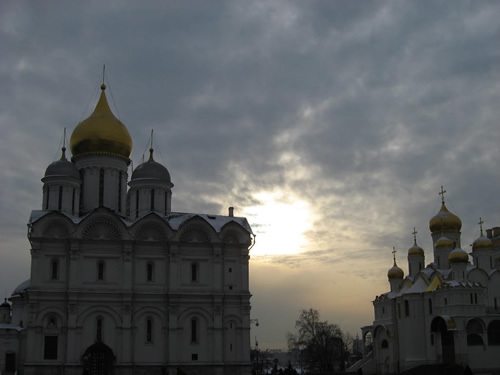 Traveling in Russia can be unforgettable, especially for lovers of the arts. There are the St. Petersburg White Nights Festival, magnificent opera and dance at the Maryiinsky and Bolshoi, not to mention the Moscow club scene. As in other countries, knowing the rules of engagement maximizes the fun. Though Russians do not smile quickly for foreigners, when they do, it is usually with sincere welcome.